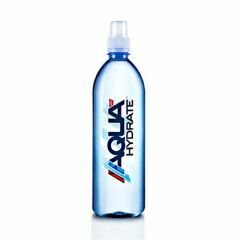 AllegroMedical.com presents The AQUAhydrate AQUAhydrate Protein Drink. Purified Water with Electrolytes, Added For Great Taste. Performance in the purest form. 2x more electrolytes than leading electrolyte-enhanced waters. Pure, great tasting water that fuels your performance lifestyle. Elevated alkanlinity to bring your body back to balance. Purified Water, Sodium Chloride, Concentrace (Magnesium Iodine, Iron, Calcium Chromium, Selenium, Zinc, Copper, Manganese, Molybdenum).